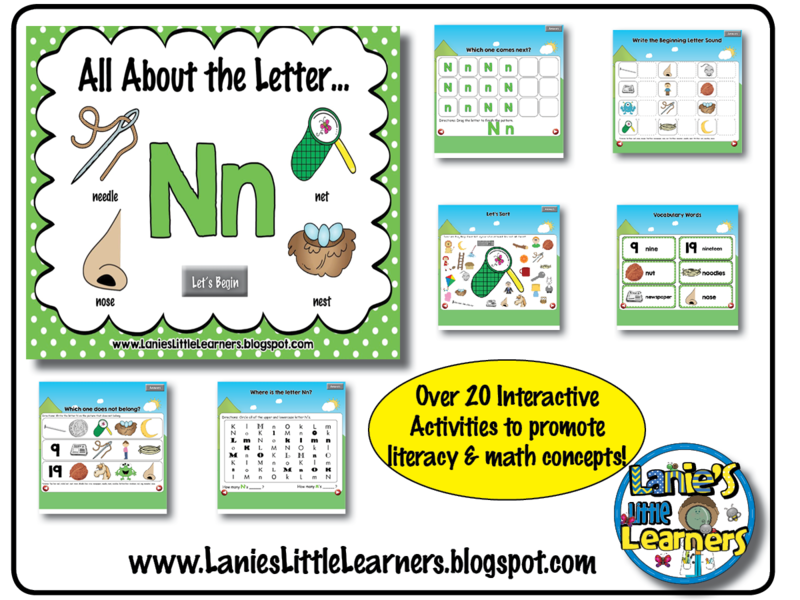 I have put together a collection of songs and read a-loud books about the Letter N.
There are over 20 pages of interactive activities to promote and reinforce letter, critical thinking, and math concepts. 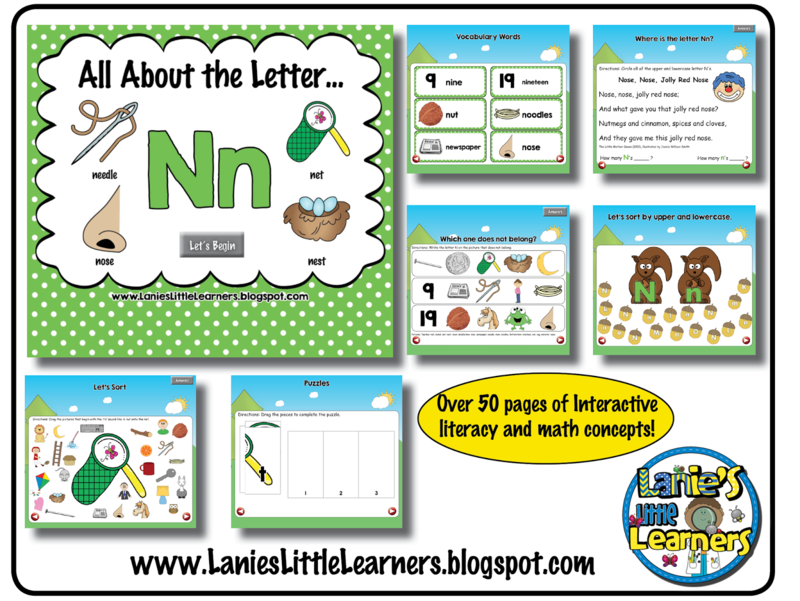 All About the Letter Nn is perfect for whole group, small group, and individual practice on the SMARTBoard or on a computer with the SMARTNotebook software installed. NEW>> Added navigation buttons to navigate pages. Added ANSWER KEYS with a link on certain pages! Click on the "ANSWERS" button to encourage self- monitoring. Then on the answer page, simply click on the navigation button to take you to the previous page. Added CVC and 4-letter puzzles beginning with the letter Nn. Where is the Letter Nn: Circle the upper and lowercase letter N.
Write the Missing Letter: Look at the picture and write the beginning letter. Nn is for Nag: Help Nellie Nag find her nut by following the upper and lowercase letter N to the nut. Let’s Sort by Uppercase and Lowercase Letter Nn: Sort the nuts by upper and lowercase letter N.
Search a Word: Look for words beginning with the Letter N. All words are hidden across and there is only one word per line. 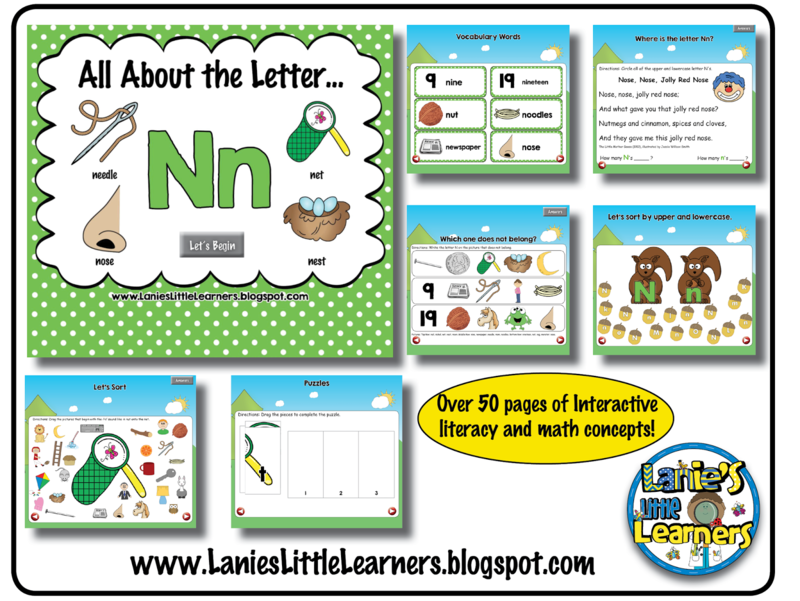 Let’s Build the Letter Nn: Use the shapes to construct the upper and lowercase letter Nn. Puzzles: Put together CVC and 4-letter puzzles all beginning with the letter N.